Kane is only likely to feature again for Spurs this season if they reach the Champions League final, after suffering an ankle injury in Tuesday’s quarter-final first-leg victory against Manchester City, while Alli injured his hand in the same game. Tottenham dominated the early stages, but had to wait until the 24th minute to forge ahead. 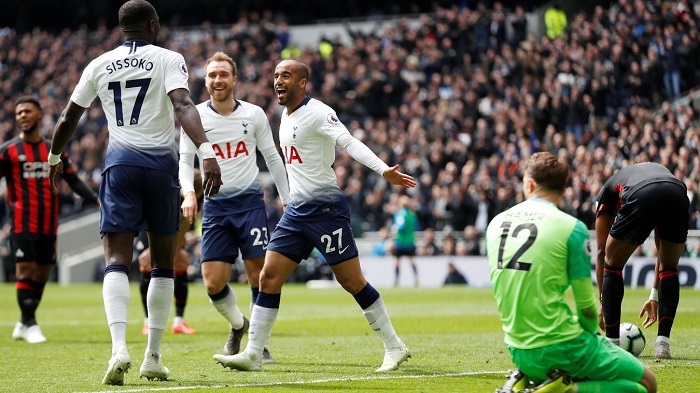 Wanyama surged into the area after Fernando Llorente failed to control Ben Davies’ pass, then rounded Ben Hamer and slotted into an empty net for his first goal of the campaign. That was followed three minutes later by Lucas’ eighth of 2018-19 in the league, the former Paris Saint-Germain forward drilling through the weak resistance of Hamer from 10 yards after being teed up by Moussa Sissoko. Steve Mounie missed the opportunity to set up a grandstand finish, heading wide from 10 yards 15 minutes from time, while Bacuna’s free kick was clawed on to his crossbar by Hugo Lloris. He then completed his treble three minutes into stoppage time, running on to Son Heung-min’s pass and lashing unerringly across Hamer and into the roof of the net. Any worries that Tottenham would struggle to make themselves at home at their new stadium have been well and truly dispelled with three wins on the spin on their return to north London. With the second leg against City looming by midweek, Pochettino could scarcely have cherry-picked more accommodating opponents than rock-bottom Huddersfield, who crumbled to a 26th defeat of a sorry season. With Son Heung-min named on the substitutes’ bench, the task of injecting dynamism into Spurs’ attack was given to the Brazilian, and he did not disappoint. The 26-year-old made life difficult for Huddersfield’s defenders all game long and scored a stunning hat-trick.